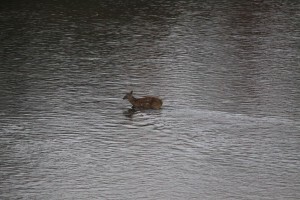 I’ve only seen this one other time…a little spotted fawn during archery season. This year I saw one around my home the second week of September. A brand new little fawn in the food plot. I told a “nature aware” coworker about it and the following week he had also seen one near his home. While helping to track a deer yesterday I saw another little spotted fawn only a few weeks old on another property. That’s 3 that I know of in the Central Michigan area. 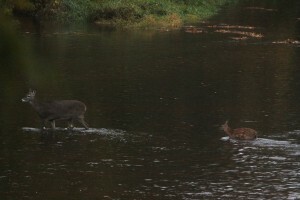 These photos were taken today (10-13-12) of “my fawn” as it crossed the river. While researching the gestation period for whitetail deer I came across many numbers and when I average them out it seems that these fawns were conceived in March. We had some strange weather this March with some days reaching 80 degrees. Photoperiod seems to be the accepted science that kicks off the breeding season. I would be curious to know if the daylight duration was similar in March to what it is the first week of November? Also I would be curious to hear from others who have seen small spotted fawns this archery season. This entry was posted in News and tagged deer, fawn, gestation, late, September, spotted, whitetail by Quinn Keon. Bookmark the permalink.